We're near the intersection of Main and N. Santa Cruz Ave, close to the Park. We are in the middle of the block, on the west side of the street, one business down from the Apple store. The Bear was built in 1991 by the Van Epps family. We've been roasting our own coffee on-site since the beginning. We offer a well-honed selection of coffee beans, all top quality and super-fresh. 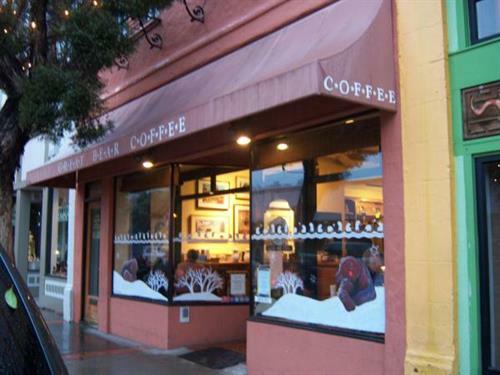 The very first roaster at the Great Bear was trained by Alfred Peet-- yes, that Mr. Peet-- but we never roasted quite as dark as he liked. We have our own blends and flavor profiles, at very reasonable prices. 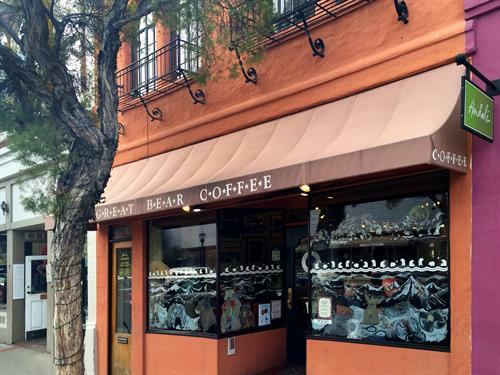 At the Great Bear we make our espresso drinks in the old ''bohemian'' North Beach style-- strong, with creamy uncomplicated foam. We love to serve a cappuccino in a porcelain cup: it's so delicious that way and fun to swirl the foam about. We have a large hot tea menu as well as a nice selection of ice teas which we brew strong and chill, serving them very cold. The Chocolate Coffee Cream is our most famous drink, concocted of chocolate, ice cream and coffee extract, topped with real whipped cream. People go ga-ga over the CCC. If you are hungry, we offer a nice selection of quality sweet and savory items including veggie lasagna, breakfast burritos, pumpkin bread, vegan chocolate cupcakes and gluten-free items-- you get the idea. We are the sole owners of information collected on this site. We only have access to information which you voluntarily give us via email. We will not sell or rent this information to anyone. We do not store your information. We will use your information to respond to you, regarding the issue you contacted us about and for no other reason. We ask that you do not email us with sensitive information. House-roasted coffee beans! Highest quality blends and varietals! so fresh! Great light meals! Easy to-go or a quick snack at the Bear.